Lawnmowers are among the essential home maintenance tools today. With them, gardening and landscaping became a lot bearable, as homeowners will never have to trim their lawns manually. These tools are worth our trust. Nevertheless, there are some instances in where they go out of control. It is not a scary predicament, but it can cause nuisances and delay in your work. Fortunately, troubleshooting the lawn mower is doable. You just have to know the issue and the corresponding resolution that should be implemented to solve it. This is one of the most prevalent issues on every lawn mower suffer. I have seen and heard many people complaining about the problem. It is not an issue to bother. Still, immediate maintenance and repair should be conducted soon. Usually, this problem occurs when you are running your lawnmower. The trouble starts when the lawn mower will suddenly puff a huge volume of white smoke. Do not mistake it for gradual and continuous emission of white smoke. No. The smoke is almost spontaneous and huge that it can always catch your attention. After the smoke was blown, the lawn mower will suddenly come to a halt. It will go in a state of suspension, in where it will not respond anymore to any starting mechanism that is built to the device. Even if you rest the lawn mower for a day, things will not go back to normal easily. If you start the lawn mower again, it might show signs of life but it will just end up sputtering plumes of white smoke again. Sooner or later, restarting the lawn mower will prove to be a difficult task. A lawn mower that is stuttering can be caused by different factors. 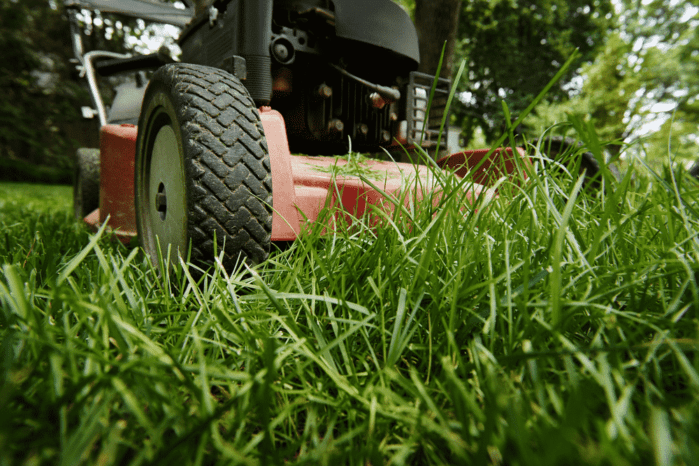 Before you start troubleshooting the lawn mower, you have to make sure that you can determine the most probable culprit to why your lawn mower died suddenly. It is not good that there is water in the fuel line or fuel tank of the lawn mower. It can always result in engine problems. That is a guarantee. Once the water has already penetrated the cylinder, ignition will become difficult. It also stops the gasoline from being ignited appropriately. The water is usually derived from excessive condensation. You can blame the external elements for this. Sometimes, a wobbly gas cap that you have not check could also cause it. To remove the water, you just need to empty the tank and use new and fresh fuel. Of course, do not forget to dispose of the oil and gas that you have previously removed in the tank. 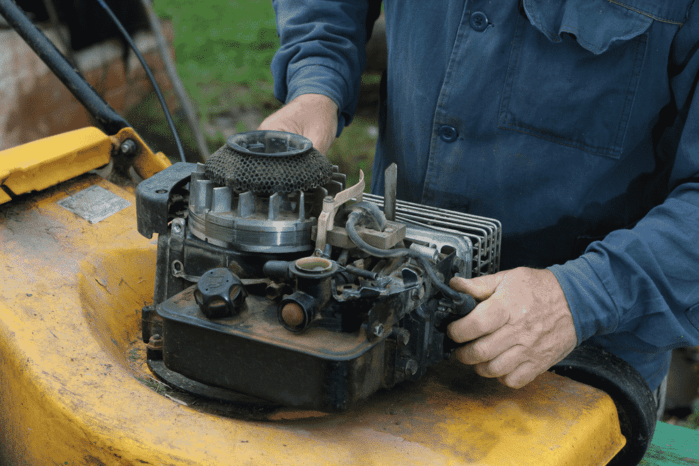 Most of the time, a stuttering and smoking lawn mower is due to a damaged head gasket. Blown head gaskets are caused by either overheating or damaged parts due to over usage or old age. Fortunately, this particular component of the lawn mower can be replaced. However, of course, it will always require money and professional services. If the head gasket is fine, check the valves of the lawnmower. They might be broken or severed. However, for me, damaged valves are least likely the cause. After all, valves do not induce compression. The mere fact that the lawn mower keeps on stuttering is a good proof that the perpetrator is the gasket. Always check the spark plug of the engine if your lawn mower cannot run smoothly. 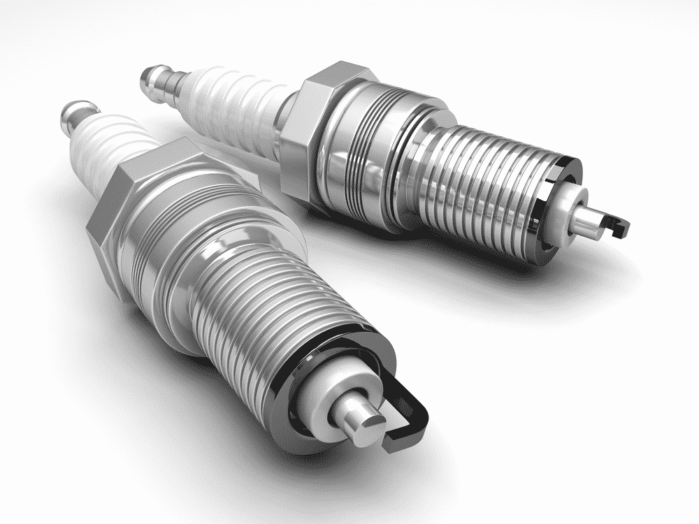 Lawnmower spark plugs, just like the ones in your vehicle, are susceptible from getting worn and damaged. Once this happens, the engine will experience irregularities in starting. Try removing the spark plug so that you can examine it properly. Check the firing tip and see if the end has an accumulation of carbon. If yes, then clean it with the use of a wire brush. After this, restart the gap as specified by the manufacturer. However, if the problem is due to a cracked porcelain housing or the deterioration in the metal bend, just replace the spark plug. Do not worry. It does not come expensive. If the lawn mower releases white smoke then dies, those three factors that I have mentioned are the most possible reasons. You have to inspect any of these parts in the event that the SHTF situation takes place. If you cannot fix the issue on your own, just refer the problem to a professional. It is better to let the pros handle the situation to prevent it from getting worse. Did you learn from this guide? If you have some questions, feel free to ask me in the comment section below. and hedge trimmer (I bought them after each and every from trugreen and agreenhand). I love them. Quiet and clean. And I have thick St Augustine grass which it mows in the an hour on a single chargewith not a problem. electric (corded or cordless) does not need power are a little dated in their assumptions. It’s a basic point that DC motors have more torque than gas magnetic generators. use for lawn care type applications.